BIØN – Building Impact Zero Network is a group of partners active in low environmental impact building techniques with positive social impact. Our aim is to share knowledge, practices and experiences in order to contribute to built environments and our communities. The Learn BIØN project aims at building and sharing knowledge across borders and involves 7 partners from 5 European countries. AES arranged the 4 week workshop in Cordwood building in Östertälje, in august 2017. 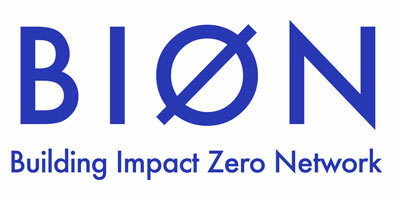 Building Impact Zero Network, BIØN was founded in 2015. It aims to share knowledge through practical and educational activities in building techniques with low environmental impact. The network strives for an inclusive architectural practice with large social impact. Currently the network is running LearnBIØN, an educational project where seven associations and university departments from five European countries cooperate for three years to train adults in the field of sustainable architecture. The seven teams defined a shared theoretical module which acts as common ground for a series of practical workshops. Six small architecture projects are built during these training events in cooperation with local communities in the involved countries. Each intervention focuses on a specific technique. Thanks to funds from the European Union’s Erasmus+ program, the BIØN-partners established a blended mobility agreement that allows participants from each country to participate in workshops of other partner countries. Further participants are recruited locally among students, professionals, NEETs or simply curious citizens. During 2017 the network has built a temporary artist’s residence in a ceramic workshop in Portugal using compressed earth blocks (CEB), a small multipurpose space with wattle-and-daub and light earth walls grafted into an abandoned concrete building in central Italy and a sales facility built in cordwood for an organic agricultural cooperative in Sweden. Three more projects are scheduled for 2018: a cultural facility in giant reed near Barcelona, a rammed earth house for an underprivileged family in southern Spain and facilities built from recycled materials for a social association in Milan. At the current stage, the program has already shown how the experience of building, namely with simple techniques and non-toxic materials, helps participants to find alternative ways of communicating, and thus assimilating new knowledge. At the same time, the built results help stimulate virtuous processes and discussions in the communities. Design and Build with Cordwood, a 4 week building workshop in Östertälje, Sweden. During this workshop we built a cordwood building to suit the needs of the newly established social enterprise Eko-Odlarna. They cultivate organic produce on a small plot of land on the outskirts of Östertälje. a mortar mix made from clay, straw and sand. We will investigate suitable ways of building, experiment with pattern making and detailing, and how to process the raw materials on site. The workshop also has a large focus on the method of “making architecture”, how can people contribute with skills, knowledge to the process of designing and making structures in a collaborative way. In the workshop we practice co-creating design and developing insights on alternative processes. We have the opportunity to work closely with the users of the building, which will be new perspectives to integrate into the project development. Participants will take part in all aspects from design, decision making, documentation, implementing the structure. In all aspects dialogue will be the means for the group to reach decision, which challenges the collective in trust, coherence and action. Through the workshop we hope to open for new ways of engaging in the built environment, to have gained further knowledge in methods of how to engage and organise the built environment from a social starting point. How to utilise resources, both skills/ insights and physical materials, in new ways to reach new results. With these aspirations, the technique can be seen as an enabler, adapting to multiple resources. The workshop will explore if and in what way this technique can have a relevance for today’s built environment.